Sad news about the passing of Srinivas Aravamudan. Srinivas addressed our inaugural meeting, in Adelaide in 2011, and was a friend of our consortium as well as of the humanities internationally. As many of you will now have heard Srinivas Aravamudan, current and former President of CHCI, passed away on April 13. This is a tremendous loss. Srinivas was a fierce advocate for the humanities. It is largely due to his vision, his dedication, his intellectual vibrancy, and generosity of mind and spirit that CHCI has become the organization that it is today. Many of you are involved with CHCI because Srinivas led it to become a truly international consortium, one that not only represents but also generates and actively supports new areas of research in the humanities. More than this, with tremendous care and intelligence, and equal measures of style and wit, Srinivas ensured that each CHCI project was a convergence of intellectual and strategic work. We will miss him terribly. Srinivas was an award-winning scholar of eighteenth-century literature and philosophy as well as critical theory and post-colonial studies. He trained in Madras, Purdue, and Cornell, and taught at the Universities of Utah and Washington before arriving at Duke University in 2000. At Duke, Srinivas taught in English, Literature, and Romance Studies and directed the Franklin Humanities Institute before becoming the Dean of Humanities. In 2014, soon after many of us gathered in Hong Kong for the CHCI annual meeting, and soon after his last book Enlightenment Orientalism: Resisting the Rise of the Novel, won the Perkins Prize for “the most significant book in the study of narrative,” Srinivas learned that he had Glioblastoma Multiforme, a vicious brain tumor. For nearly two years, Srinivas underwent treatment, experimental and traditional, hoping against the odds. Throughout this ordeal, he was bolstered by the relentless and compassionate support of his wife Ranjana Khanna. And throughout it all, he continued to envision new projects for the humanities; expand his own scholarship to deal with literary criticism in the time of the anthropocene; oversee the Humanities Writ Large initiative at Duke; lay the groundwork for CHCI’s African Humanities and Arts Consortium; and serve as the president of both the American Society for Eighteenth Century Studies (ASECS) and CHCI. We will dedicate the 2016 CHCI annual meeting to Srinivas’s memory. The London meeting will focus on “Area Studies in a Globalizing World.” I expect that we will feel Srinivas’ presence, as well as his profound absence throughout our time together. I am grateful to our hosts in London, Roger Kain, above all, for allowing us to devote the evening of Wednesday, June 29 to a memorial and celebration of Srinivas’s contribution to the CHCI and the humanities more generally. All CHCI members and meeting attendees are invited to attend. In time, we also will find more permanent ways to remember him. Over the past two years, and even before Srinivas learned of his illness, the CHCI Board has planned for presidential succession and institutional transition. We have worked closely with CHCI staff on matters large and small, and the process is underway for the organization to move from Duke to Madison before the end of the year. I am grateful to the past-presidents of CHCI, members of the Board, and staff at Duke, in particular, Sylvia Miller and Conal Ho, for their resilience and care during this difficult, often very sad period. I can assure you that in the coming years, I will look forward to sustaining Srinivas’s legacy at CHCI as well as initiating new projects and initiatives that will energize the Consortium and the global humanities more generally. In the meantime, we will grieve. I know that you will join me in sharing our profound sympathy with Ranji and their young son Nachiketa Kumara, as well as Srinivas’s family, friends, and colleagues around the world. 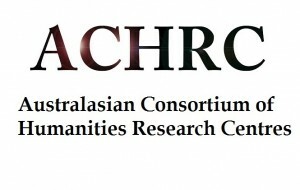 I write on behalf of the Australasian Consortium of Humanities Research Centres (ACHRC) to protest against the severe and destructive cuts recently visited upon the national galleries, museums, archives, and libraries (GLAM). Their work remains vital, not only to academic research, but also to the community at large and more broadly to the nation’s understanding of its own identity and its own achievements, past and present. These recent cuts, on top of the ‘efficiency dividend’ regularly imposed upon the national GLAM sector’s activities, have made it impossible for them to maintain the number and quality of the services they offer Australia’s researchers as well as the nation at large. Like most of the individuals and institutions who have protested to the government in recent weeks, we would point to the arrested development of the Trove resource at the NLA as exemplary. 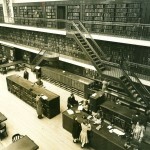 Trove is a vital portal to research data for all the nation’s scholarly, teaching, and cultural institutions. It is a model of its kind around the world, a point vigorously expressed by the New Zealand academics on our board, who find the cut mystifying. An efficiency dividend that kills off its maintenance and development will distribute huge inefficiencies around the nation and the globe. Literally millions of research tasks will become harder and more time-consuming. Trove underwrites much of the research humanities scholars do, and ensures its impact by providing access to the public. It underwrites education by allowing individuals to combine teaching with research more efficiently, because we no longer have to travel across the country and spend days physically located in a library finding the sources we need. The NLA is justly proud of its achievement with trove and it is clear that only acute pressure from cascading cuts would force it to consider so drastic a measure. In addition, Trove is a vital part of the many fundamental research facilities offered by the GLAM sector for humanities researchers. Along with the Academy of the Humanities, we would extend our protest against recent cuts by asking the government to consider funding the GLAM sector through its national research infrastructure. Australian culture is not, in fact, shrinking by a couple of percent per annum, and the GLAM infrastructure for supporting it has become as lean as it can be after more than two decades of attrition. 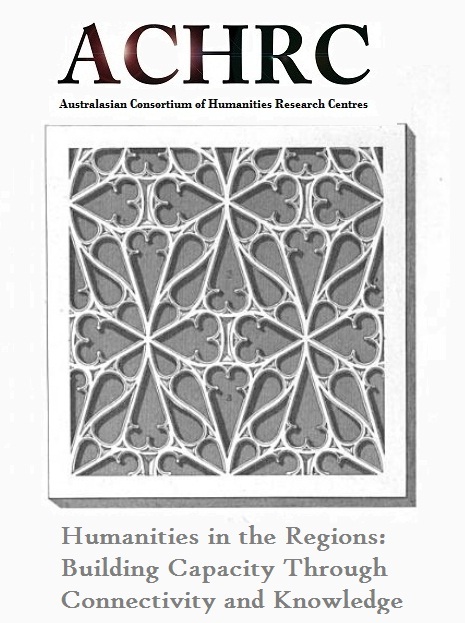 Open and searchable collections provide the essential infrastructure for the tens of thousands of academics and citizens engaged in humanities research, on the spectrum from family history to world-leading cultural analysis. When the institutions that support them are under constant stress, education, culture and research outputs suffer. 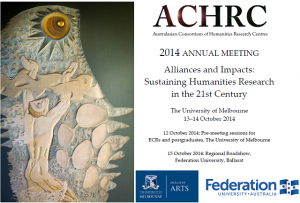 The Annual Meeting of the Australasian Consortium of Humanities Research Centres took place in mid-October in Melbourne. The two-day meeting with optional pre-meetings immediately prior gathered representatives from all states and territories bar the Northern Territory, plus New Zealand and Kong representatives. 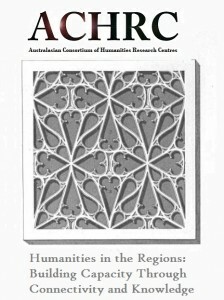 A range of institutions were represented as well as other peak bodies including the Australian Research Council, the Australian Academy of the Humanities, Australian Institute for Aboriginal and Torres Strait Islander Studies (AIATSIS), The Australasian Council of Deans of Arts, Social Sciences and Humanities (DASSH), Council for the Humanities, Arts and Social Sciences (CHASS). The very impressive program put together in collaboration with Kate Darian-Smith and the ACHRC Advisory Board saw keynote speaker JD Hill, Head of Research at the British Museum, deliver a presentation on “The Impact of Impact on the Humanities and the Wider Cultural Sector: a View from the UK”. 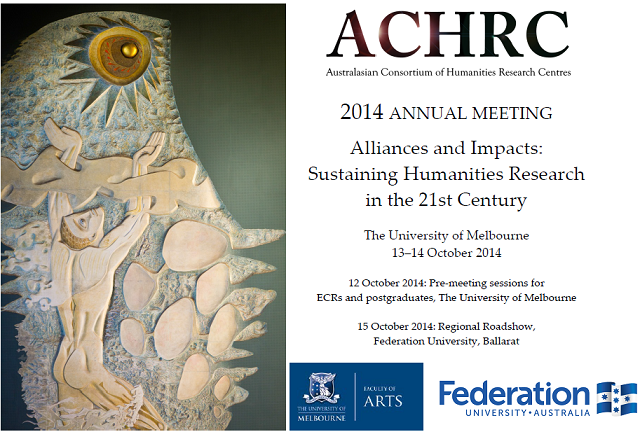 JD Hill’s presence at the ACHRC annual meeting was enabled by the University of Western Australia’s Institute of Advanced Studies where he is a 2014 Professor-at-Large under their visiting fellow program. This keynote looked at the positive aspects of a move towards measuring impact, especially through case study analysis, which has driven collaboration and interdisciplinarity across sectors and opened new possibilities for drawing on research and expertise outside of one institution’s capacity to provide. 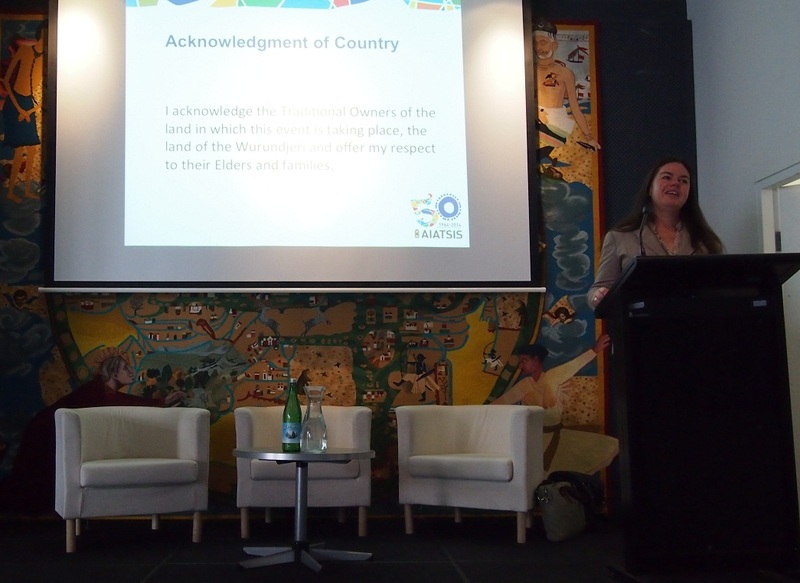 And it acknowledged the negative aspects where frequently cultural organisations can be used as impact providers. A session on Research Alliances: International Networks saw Susannah Radstone, Dean of Research at the University of South Australia, Glenda Sluga, from the University of Sydney, Jenny Lewis, The University of Melbourne and Simon Haines, Chinese University of Hong Kong, discuss practical strategies employed nationally and internationally to promote international research collaborations. A session on Strategic Research Teams saw Imedla Whelehan from the University of Tasmania discuss her institution’s C-Domain project – where the C is Culture. The project was designed to build ECR and HDR, and reluctant researchers, capacity in collaborative research. 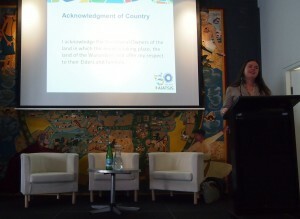 Carolyn Stephens from Monash discussed her Sonic Japan Digital Repository. 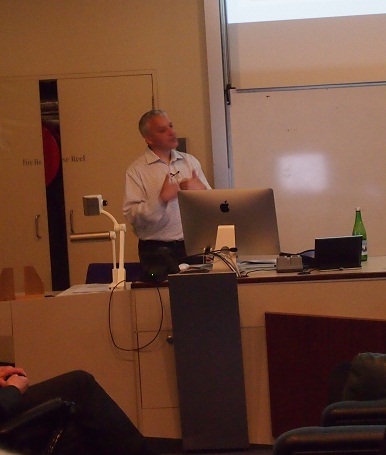 David Lowe form the Alfred Deakin Institute at Deakin University discussed a number of projects that develop partnerships, attract postdocs, and build capacity. 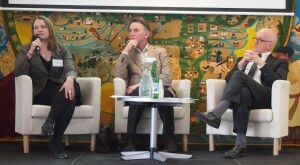 A session on Humanities Research: Future Directions saw Christina Parolin and Kylie Brass form the Australian Academy of the Humanities discuss their Mapping the Humanities and Social Sciences project, due for launch on 28 October. 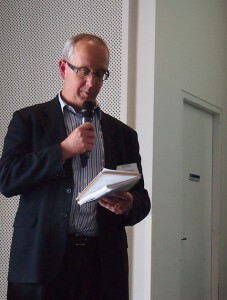 Robert Phiddian discussed the sustainability of humanities research centres project and sought input from the floor. At the close of the first day of the meeting, J.D. Hill gave a public lecture about the History of the World in 100 objects phenomenon. A session on Humanities Research Models and Practices of Collaboration saw several projects posed comparatively. Heather Gaunt from the Ian Potter Museum discussed work teaching arts to health discipline students. Shaun McVeigh of the Institute for International Law and the Humanities at the University of Melbourne discussed the space between law and humanities in the area of jurisprudence. Lachlan MacDowell from the Centre for Cultural Partnerships at the University of Melbourne discussed their many community-based arts projects. Julie McLeod from the Melbourne Social Equity Institute, University of Melbourne, discussed a virtual research network set up to foster interdisciplinary research and ECRs. 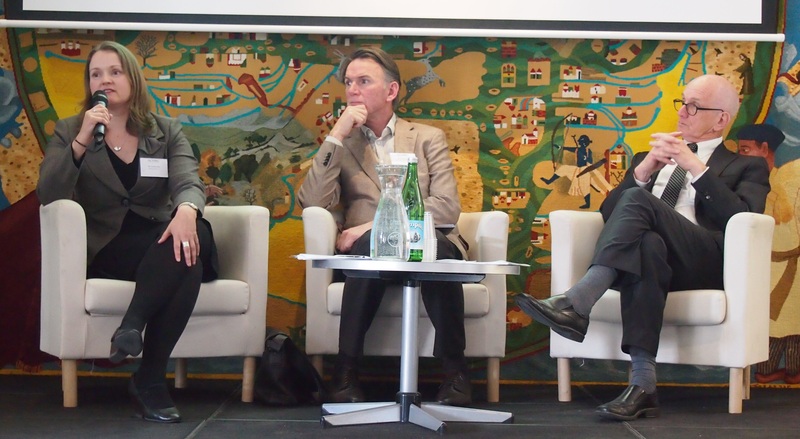 A session on Funding New Alliances combined the expertise of Denise Meredyth from the ARC, Steven Schwartz from CHASS and Gerard Vaughan, Australian Institute of Art History, University of Melbourne. Denise talked about changes at the ARC that make funding requests more Hums friendly, including extending the kinds of organizations that aren’t asked to make a cash contribution and changing the fractional requirements for Chief Investigators on Discovery Projects. Steven Schwartz discussed the opportunities provided by crowdfunding for Humanities projects. Gerard Vaughan talked about Philanthropic organisations and making approaches to endowed organizations and individuals. 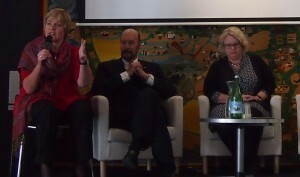 A session on Partnerships saw Robin Hirst from Museums Victoria, Peter Rose from the Australian Book Review and Louise Box from Partnerships 21 discuss ways that universities can work with organisations in new and creative ways. Hirst discussed the role of collecting organisations in partnering with universities on Linkage Projects and what criteria they use to determine their involvement. Peter Rose talked about the role of the Review in developing scholarly research for public readerships. Louise Box discussed the role for an organisation like Humanities 21 in brokering collaborations between humanities researchers and the business sector. 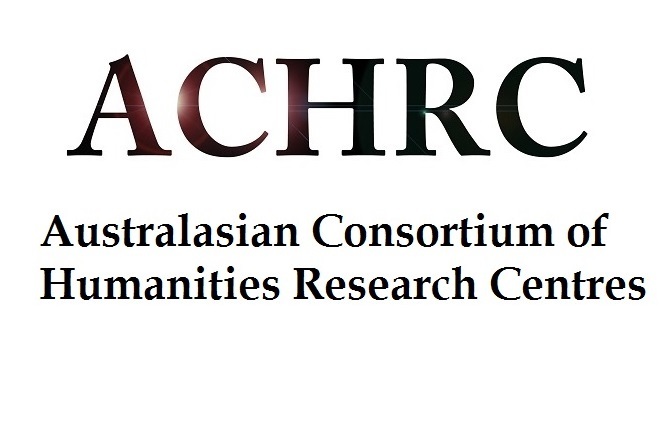 The ACHRC’s AGM saw new members added to the Advisory Committee and the decision to take up the offer from Associate Professor Kerry Taylor to host the 2015 event in New Zealand.